The Dashboard contains mini boards or widgets which contains different information, links or activities to help you get the most of out Tanda. One of those widgets is What Should I Work On? When you first open your Tanda account, the Setup Checklist steps you through how to setup your account. Click on a name or button in the checklist to go to that section in Tanda. For detailed information on how to setup your account, have a look at our Get Started with Tanda articles. 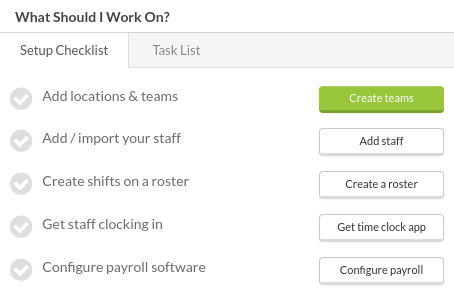 The Task List shows you key activities that should be completed in Tanda. 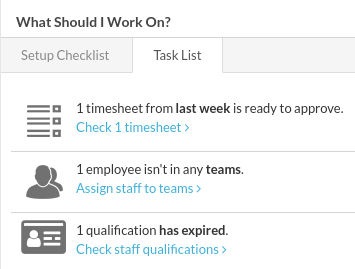 All users (except employees) will see the Task List, however Tasks will be relevant to the type of permission. Tasks will have a link below the activity to take you to the area in Tanda to action this. Once you have completed it and you return to the Dashboard it will no longer be visible. You can still continue using Tanda without completing Tasks, but some activities will impact on those, such as your Payroll Integration being disconnected will mean you can't automatically import staff and export timesheets, so it's best to see the Task List as a goal to complete to get the best from your account.